While sales of Bellow's first few novels were modest, that turned around with Herzog. Bellow continued teaching well into his old age, enjoying its human interaction and exchange of ideas. He taught at the University of Minnesota, New York University, Princeton University, the University of Puerto Rico, the University of Chicago, Bard College and Boston University, where he co-taught a class with James Wood ('modestly absenting himself' when it was time to discuss Seize the Day). 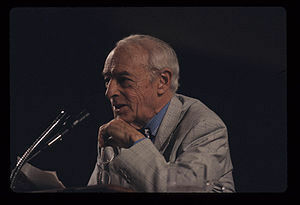 In order to take up his appointment at Boston, Bellow moved in 1993 from Chicago to Brookline, Massachusetts, where he died on April 5, 2005, at age 89. He is buried at the Jewish cemetery Shir HeHarim of Brattleboro, Vermont. 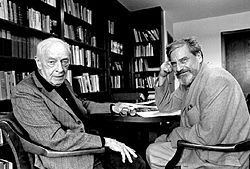 The Adventures of Augie March (1953) is a novel by Saul Bellow. It centers on the eponymous character who grows up during the Great Depression. This picaresque novel is an example of bildungsroman, tracing the development of an individual through a series of encounters, occupations and relationships from boyhood to manhood. Herzog is a 1964 novel by Saul Bellow. In a nod to the epistolary novels of early British literature, letters from the protagonist constitute much of the text. Herzog won the 1965 National Book Award for Fiction. Time Magazine included the novel in its All-TIME 100 Greatest Novels|TIME 100 Best English-language Novels from 1923 to 2005.